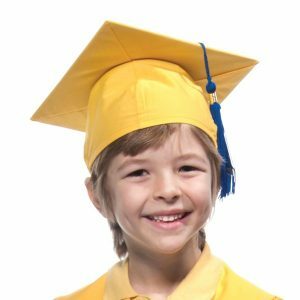 We want your preschool and kindergarten graduation to run smoothly and be as perfect as it can be. So, we’ve put together a few tips to properly care for graduation caps and gowns in time for graduation day. Follow these quick tips to ensure that your little graduates look polished and perfect on their big day! 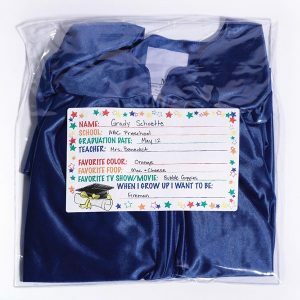 Care for graduation caps and gowns begins with the question of “to wash or not to wash?” Most graduation gowns can be worn as is; they typically don’t require washing before graduation day. If you feel like washing your gowns, follow these tips. Shiny Graduation Gowns should be spot washed by hand only. Matte Graduation Gowns can be machine washed on cold and hang dried. If your gown has a few wrinkles in it when you receive it, we recommend the following to care for graduation caps and gowns. For Shiny Gowns, hang them from a clothes hanger for 24 hours to release the wrinkles. If time is an issue, you can steam them on low heat. For Matte Gowns, we recommend ironing/pressing the gown on very low heat, with a towel placed between the gown and iron. 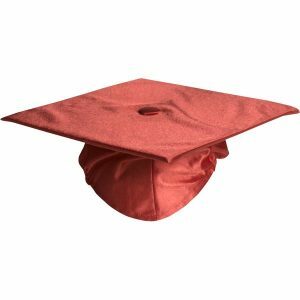 Store your graduation caps flat, in a dry location, as the mortarboard could take on moisture if it is too humid. Another tip to care for graduation caps and gowns is to keep your gown (matte or shiny) on a clothes hanger in a spacious area for as long as you can before your graduation ceremony. This will ensure that the gown stays as wrinkle-free as possible. Dress your little ones in almost any color, as our gowns are opaque enough to cover most clothing. We do recommend wearing lighter colors underneath a white gown for it to look its best. Gowns should be worn with the zipper on the front. Caps are perfectly sized to fit young children, and come with an elastic band sewn in, so it will fit snugly to your child’s head. Tassels are typically worn on the right side and shifted to the left when your graduate has received his/her diploma. The care of graduation caps and gowns doesn’t stop once graduation is over. If you want to keep and store your child’s graduation cap and gown for a long time, a plastic case with a tight lid works best. Place clothes deodorants and/or chemicals inside the case with your cap and gown to keep moisture from the items, and eliminate molds and mildews. A Graduation Keepsake Bag also works well for storing graduation items. We hope these few tips help you in your graduation planning, and we wish you and your children all the best on graduation day!